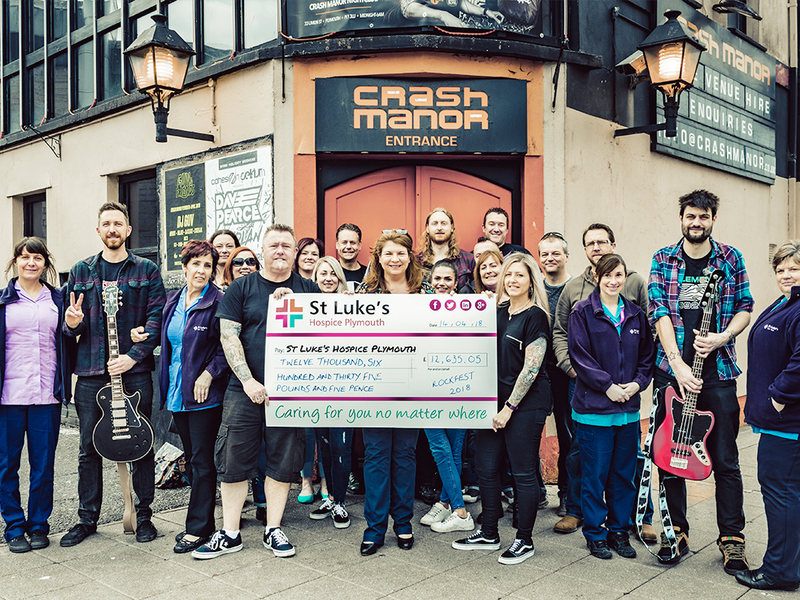 Rock not only raised the roof but an amazing amount for St Luke’s at the recent annual live music extravaganza at Crash Manor in Plymouth. The two-day event saw 20 bands, including Rusty Angels and Funky Munks, play for no fee, attracting a big crowd and resulting in £12,635 raised to help us continue caring for patients at the end of life – a record amount for Rockfest in the ten years it has been supporting our charity. Cuz Cussen is the force behind Rockfest, which he started 17 years ago, fundraising for various charities close to his heart. It was following the death of his beloved mum Dot, in May 2008, that he decided to donate all the money raised each year to St Luke’s. During the last few months of her life, Dot received our care and spent her last few days at the specialist unit at Turnchapel. Seeing first hand the dedication of our team meant St Luke’s gained a special place in Cuz’s heart, which has spurred him on to raise an incredible £90,000 for us. Thank you so much to Cuz and everyone who helps make Rockfest the big success it is. We really appreciate your support!